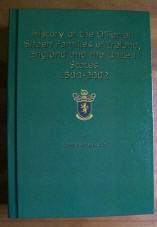 This book is a history of the origins and genealogy of the O'Ferrall Shaen families. In Chapter 1, the writer provides a brief account of the origins and history of the Irish people. In Chapter 2, he explains the analogy used in tracing the Shean/Shane family in the United States back to the immigrant ancestor, Henry Shean, who arrived first in Philadelphia and then settled in Maryland sometime before the Revolutionary War. In Chapters 3 and 4, he provides a documentary account of the early Shaen family as the result of meticulous records research in Ireland. In the latter part of Chapter 4, he includes contributions to the family history provided by Descendants who live today in Ireland, England and the United States. Chapter 5 provides information about the immigrant ancestor, Henry Shean [I], and his Descendants who live today in Maryland, Pennsylvania, and other states. Chapter 6 provides information about John Shean [VI], the eldest son of Henry Shean [I], who moved to Kentucky circa 1804, and his Descendants who live today in Kentucky and other states. Chapter 7 provides bits of Sheane Miscellanea contributed by Donald R. Sheane regarding the possible origins of his County Wicklow Sheanes and the genealogy of the Roscrea and Mountmellick Sheane families of Ireland and the United States. And, lastly, Chapter 8 provides the results of additional research undertaken on the O'Ferrall Shaens who lived in County Antrim. The appendixes found in Part II of this book contain extracts of official Irish, English, and United States records which verify and support the genealogies and history of the O'Ferrall Shaens and their Descendants in Ireland, England, and the United States, which are discussed in the narrative chapters. After the manuscript of the first edition of the History of the O’Ferrall-Shaen Families had been completed and sent to the publisher and continuing for at least two months after the book had been printed and bound in April 1994, Mr. Seán Ó Néill, the writer’s researcher in Dublin, Ireland, began to have some second thoughts about the origins and lineage of Francis Shaen [III] of Cherryvalley, County Antrim. In his continued research of the Shaens and Sheanes of Counties Westmeath and Laois and the Shaens, MacShanes, and Shanes of County Antrim, Mr. Ó Néill found additional documentation in old Irish records with regard to the various Shaens/Shanes and their families of the times. In particular, he discovered that other Mac Shanes and Shanes had lived in County Antrim in the late 1600s and early 1700s in the proximity to Cherryvalley, and that caused some doubts in his mind about the descent of Francis Shaen [III]. He suggested to the writer that further research was warranted to determine if Francis [III] was possibly descended from one of the other MacShane or Shane families of County Antrim instead of the Westmeath O’Ferrall Shaens. Moreover, in order to meet the promised deadline for publication of the book in April 1994, the writer, in haste, failed to proofread the manuscript thoroughly before sending it to the publisher. As the result of the rapid flow of new information sent by Mr. Ó Néill, the writer found it necessary to revise the draft of Chapter 4 several times following the arrival of each increment of data in the mail whilst at the same time attempting to finalize the book to meet the announced publication date. Since these changes dealt primarily with the sixteenth and seventeenth century Shaens of Counties Westmeath and Antrim, the writer felt obliged to consider and analyze the new discoveries Mr. Ó Néill had found in old Irish records. Therefore, the aim of the second edition is fivefold: (1) To confirm the earlier belief that Francis Shaen [III] of Cherryvalley, County Antrim, was an O’Ferrall Shaen of Westmeath origin; (2) To incorporate the Addendum to the book published in 1995 as Chapter 8 of the second edition; (3) To correct all known typographical errors and obvious mistakes which were printed in the first edition; (4) To add new information about the Descendants of the “Crix” Shaens of Hatfield Peveral, County Essex, England, in the United States; and (5) To provide more detailed information about the genealogy of the Sheanes of Roscrea, County Tipperary, and Mountmellick, County, Laois, in Ireland and the United States. I first became interested in genealogy circa 1976 while I was serving as an instructor of Military Strategy and National Policy at the U.S. Army Command and General Staff College at Fort Leavenworth, Kansas. The college library had a microfilm reader room, and I soon discovered the library staff would order for me copies of Federal Census microfilms on inter-library loan from the branch of the National Archives located in Kansas City, Missouri. Since my Grandmother Bess Shean had related many interesting stories of my ancestors when I was a boy, I concluded that here was a great opportunity to learn about my Shean and other families by reviewing and copying the entries about them from the Federal Censuses. Being an excited novice to the world of genealogy, I took a short course in genealogical research and became convinced that I could learn the complete histories of my several families in only a few short months. As the light of reality began to dawn on me and as my experience over the years since has taught me, I know now that one can spend a lifetime involved in family research and still not resolve all family relationships or obtain all the answers. This History of the O'Ferrall Shaen Families is the product of what I have learned since 1976, and I wish to share their story with all Descendants and persons who are interested in the history of this family of ancient Irish origin. The Irish people are descended from one of the oldest races of mankind which began to settle in Western Europe sometime prior to 1000 B.C., and their westwardly migration across Europe continued until about 500 B.C. They were of the Celtic tribes which swarmed across Europe in three large waves of migration over this period of time. Specifically, they were of the Clan-na-Mile or Milesian Gaels who eventually conquered the Emerald Isle; they came from an area known now as Galicia in Northwestern Spain; and they followed in the wake of at least three earlier peoples; the Partholonians, the Nemedians, and the Tuatha-de-Danans, the latter of whom became known as Picts. And, most of these earlier peoples may have been tribes of preceding Celtic migrations. Then, commencing about the year 800 A.D., the Vikings (i.e., Scandinavians) began to raid and pillage the coasts of Ireland before actually arriving in greater numbers to conquer and settle in large areas of the island nation. In their Victory at the Battle of Clontarf in 1014, the Irish succeeded in winning dominance over the Vikings and began the process of Gaelicizing the Northmen who remained. Still later, following the Norman Conquest of England, came the Anglo-Norman adventurers, the English, the Scots and Welsh, and lastly the French Huguenots. And, although the Irish pride themselves on their ancient Gaelic heritage, they are a mixture of peoples. To remind the reader of this fact, I have written Chapter 1 to provide a brief account of the origins and history of the Irish nation. When I first began tracing my Shean ancestors of West Point, Kentucky, I could go no farther back than Charlton D(itto?) Shean [I], who was a prominent lawyer of his day in North Hardin County. My Grandmother related that she thought Charlton D. Shean and his wife Jane E. (Miles) Shean had come from Indiana or that possibly Jane E. had come from Indiana since she was not a native of Hardin County. Therefore, in 1980, I extracted some 250 Shean addresses or variant spellings from all the American Telephone and Telegraph (AT&T) Phone Directories I could find for cities and communities throughout the United States, prepared and mailed a questionaire to approximately half of the addressees on the list, and received 36 responses. My aim in sending out the questionaire was to make a connection with one of the early Shean families, particularly in the states which comprised the American Colonies. The results of the survey were rather interesting, but unfortunately I could find no link to other Sheans. I discuss the survey and the results it produced in Chapter 2. The one really positive result the survey produced was the response from the late Willoughby G. Sheane who was descended from the Mountmellick Sheanes of County Laois. Will and I then began a correspondence which was particularly rewarding for me. He recommended Mrs. Marie C. Wilson of Belfast, Northern Ireland, as a competent researcher who had done some research for him on Sheanes in Ireland. After a further review of the Federal Censuses and court records in Kentucky, I discovered that Charlton and Jane Shean were natives of Shelby County and that both their families had migrated from Harford County, Maryland, to Kentucky. In Chapter 2, I explain the analogy I used in tracing our Sheans back to Maryland and in discovering where they lived there. After research in Maryland indicated our immigrant ancestor, Henry Shean, had probably arrived there before the Revolutionary War, I then contacted Mrs. Wilson in Belfast and had her conduct research in an effort to learn more about him. As luck would have it, Mrs. Wilson uncovered the Betham Will Extract for one Langford Shaen, Gentleman, of County Antrim, who provided the names of his "natural" sons in his Will. One of the names was Henry, and as we found out as the research progressed, the given names used by the Langford Shaen family in County Antrim were also used by the Shean family of Maryland. Although we could find no record of Henry arriving in the Colonies or leaving Ireland, the similarity of given names became ever more convincing that we had made the connection. Mrs. Wilson was able to trace the family back to the early 1700s through available records and found evidence that our Shaens were possibly connected to the Shaen Barons of County Westmeath. Also, Mrs. Eilish Ellis conducted an independent records search for me in Dublin and arrived at more or less the same conclusion. After a respite of some seven or eight years and mounting frustration in not being able to trace the family back further, the idea occurred to me that the family had changed their surname, probably sometime in the early 1500s. When I again contacted Mrs. Wilson with this possibility for further research, she recommended that I contact a Mr. Seán Ó Néill of Dublin, whom she regarded as a specialist in seventeenth century family research. Fortunately, Seán Ó Néill accepted the challenge to assist me in the Shaen family research and discovered in a relatively short period of time that they were a branch of the O'Ferrall family of Counties Longford and Westmeath and that there had been one Seaan Mac Seaan O Ferghail Ban who made the decision to drop the "Mac" and "O Ferghail Ban" from his Irish name and Anglicize it to only "John Shaen." Furthermore, by another stroke of exceedingly good luck, this fact has been documented in the Linea Antiqua which is a large book on the genealogy of eight or more prominent families of Ireland and which was compiled by one Roger Farrell as of 1709. This volume has been microfilmed and is held by the Genealogical Office in Dublin. In his work, Roger Farrell provides a complete genealogy of the early O'Ferralls, and, as if by some miracle, the Shaen lineage is clearly shown by generation from John Shaen [I], son of Daniel Mac Shaen Ferrall, to Sir Arthur Shaen in the midst of the O'Ferrall Family Tree on pages 72-73 of the Linea Antiqua. This documentation provides the recorded proof of who we are, and it goes back by generation to antiquity. The areas of controversy relate only to those several members of the early Shaen family of whom Roger Farrell had no knowledge or whom he neglected to record in his Linea Antiqua as having lived in the seventeenth and early eighteenth centuries. Specifically, there was Francis Shaen [III] who lived from 1634 to 1716 and from whom the Shaens/Sheans/Shanes of the last half of Chapter 4 and Chapters 5 and 6 are descended. Although one will not find his name in the Linea Antiqua, Francis Shaen [III] is documented in official Irish records of his day and by the inscription on his crypt in St. Aidan's Churchyard Cemetery at Glenavy, County Antrim. With regard to the remaining contents of this book, Chapters 3 and 4 provide the documentary account of the early Shaen family in Ireland as the result of the meticulous records research conducted by Mrs. Marie Wilson, Mrs. Eilish Ellis, and Mr. Seán Ó Néill in Ireland. The latter part of Chapter 4 includes contributions made to this book by Richard Noel Vance Shane of his ancestors as they are descended from Hector Shane, who was one of the four "natural sons" of Langford Shaen [I] and a brother of Henry Shean [I], who emigrated from his homeland to America. Chapter 5 provides information about Henry Shean [I] and his Descendants who stayed behind in Maryland and those who reside today in the areas of White Hall, Maryland, and in Dover and York, Pennsylvania. Chapter 6 provides information about John Shean [VI], who was the oldest son of Henry Shean [I] and who migrated to Shelby County, Kentucky, circa 1804, and his Descendants who lived in Kentucky and elsewhere and those living today who are spread throughout the United States. Lastly, Chapter 7 provides bits of Sheane miscellanea which have been contributed by Donald R. Sheane of Wicklow, County Wicklow, regarding the various possible origins of his own ancestry and about which I have taken the liberty to offer my own thoughts. The appendixes found in Part II of this book contain official documentation which verify and support the O'Ferrall Shaen/ Shean/Shane genealogies in Ireland, England, and the United States.